Our aim is to make your stay as comfortable as possible... large en-suites, crisp bed linen, handmade soft furnishings, digital TV, complementary tea tray and delicious homemade cake... all add to a peaceful and relaxing stay. 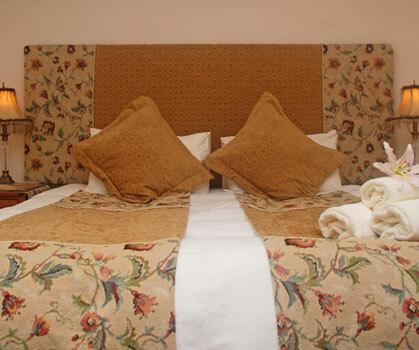 Our three comfy rooms and two lavish suites have been individually designed to make you feel special. All you need to pack are your clothes and your toothbrush ! Prices are per room, per night based on 2 sharing.